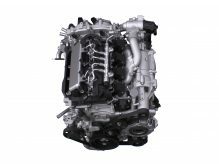 Mazda’s new SKYACTIV-X engine, which combusts through compression ignition, shows the potential to reduce emissions from an internal combustion engine to below that of an electric vehicle when measured well-to-wheel. Committed to the principal of the right solution at the right time, Mazda has concluded that, until the growing quantity of power from renewables replaces the dirtiest forms of electricity generation such as brown coal, electric powertrains do not currently satisfy to society’s wish for a drastic reduction in greenhouse gas emissions. Rather, the company is focusing on bettering the real-world emissions of EVs by maximising the efficiency of the internal combustion engine, as exemplified by its new, next-generation SKYACTIV-X petrol engine. This is not to suggest Mazda is turning its back on the development of the electric powertrain. Committed to reducing its corporate average ‘Well-to-Wheel’ CO2 emissions to 50% of 2010 levels by 2030, and to 90% by 2050, the company will introduce an EV and mild hybrid technology -or microhybridisation- in 2019, models with built-in batteries in 2020, and the brand’s first plug-in hybrid in 2025. With two thirds of global electricity production currently relying on the use of fossil fuels, Mazda believes regulations placing the absolute emissions of an EV (electric vehicle) at zero to be disingenuous. In order to more correctly measure CO2 emissions over the life cycle of a vehicle, Mazda is moving beyond current ‘Tank-to-Wheel’ evaluations (which consider only emissions whilst driving), to a ‘Well-to-Wheel’ method, which also considers fuel extraction, manufacturing and shipping. The use of ‘Well-to-Wheel’ emissions evaluation will allow Mazda to make a more accurate assessment of the appropriate powertrain development paths to pursue in the immediate future. In this context, the company has reconsidered the ecological merits of EV vehicles which consume power generated by using fossil fuels. A mid-sized electric car consumes around 20 kilowatt-hours of electricity per 100km. Production of this power with coal translates into CO2 emissions of 200g/km; with petroleum, 156g/km; and with LNG (liquefied petroleum gas) 100g/km. When converted to a ‘Well-to-Wheel’ figure, then, the average CO2 emissions of an EV are some 128g/km, depending on the power generation source, whilst that of a Mazda SKYACTIV-G petrol engine of comparable power is 142g/km. 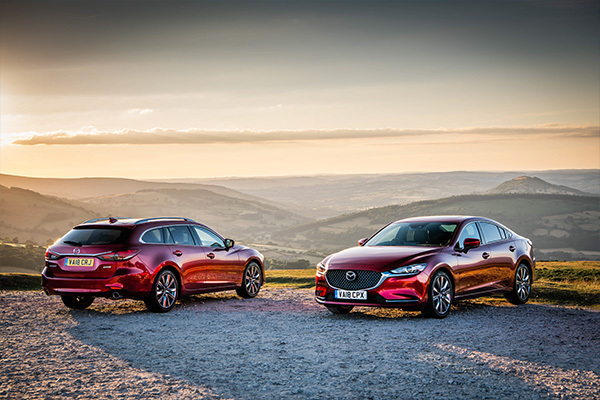 This means that with as little as a 10% improvement in efficiency, SKYACTIV-G engine emissions will be on a par with those of electric vehicles. In fact, a SKYACTIV-G engine produces less CO2, well-to-wheel, than EVs whose electricity is generated by coal or petroleum. 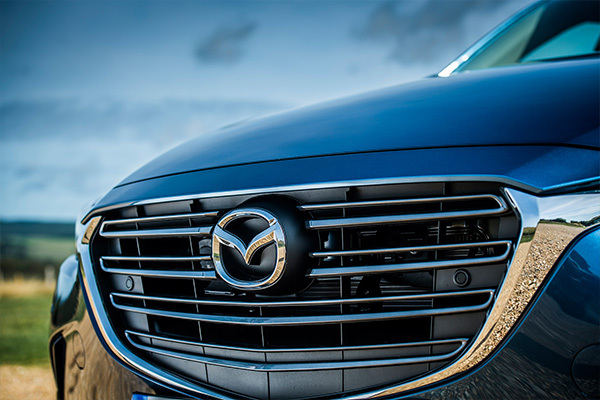 And whilst EVs using LNG-produced electricity have 30% lower emissions, Mazda believes it can improve the internal combustion engine sufficiently to match that level. 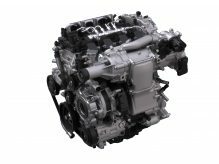 Mazda’s new SKYACTIV-X engine represents a significant step towards that goal. 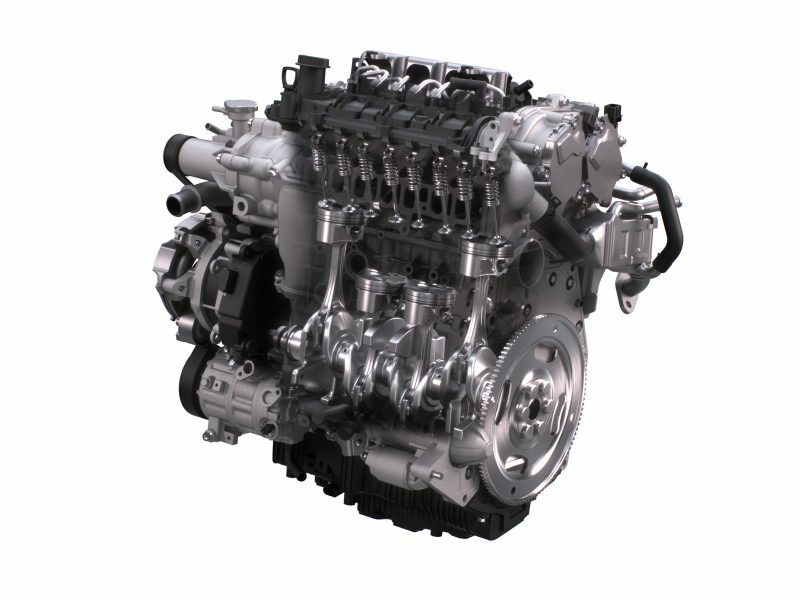 It is the world’s first commercial petrol engine to use compression ignition, in which the fuel-air mixture ignites spontaneously when compressed by the piston. 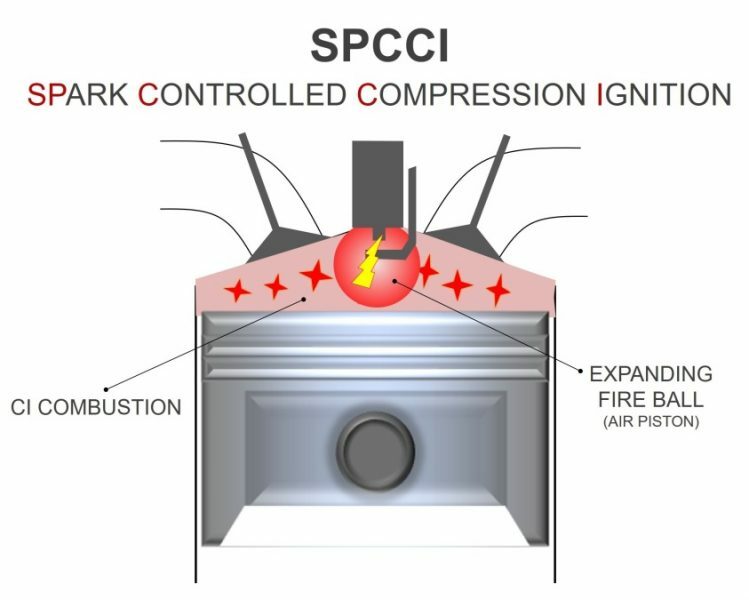 The company’s proprietary combustion method -Spark Controlled Compression Ignition (SPCCI)- combines the spark ignition of a petrol engine with the compression ignition of a diesel. This overcomes two issues that have, until now, impeded the commercialisation of compression ignition petrol engines ; maximising the operating zone in which compression ignition is possible, and achieving a seamless transition between compression ignition and spark ignition. Two of the key factors to the successful operation of SPCCI are; firstly, the engine’s ability to switch from the ideal, stoichiometric, 14.7:1 air-to-fuel mixture of a conventional petrol engine to the lean-burn mixture -over 29.4:1; and secondly, the continuous use of spark plugs.When the engine is cold or running at high revs, the spark plugs ignite the mixture in a conventional manner. When the engine is in lean-burn mode -about 80% of the time- the spark plugs ignite a pulse of fuel-rich mixture injected into the centre of the cylinders under ultra-high pressure during the compression stroke. This, in turn, provokes compression ignition with a rapid and particularly even burn which is leading to a more powerful piston stroke. The combustion timing is controlled by the flame from the spark plug. Hence, SPCCI combines the advantages of both petrol and diesel engines to achieve outstanding environmental performance, power and acceleration. Combined with a supercharger to boost intake pressure, compression ignition delivers unprecedented engine response and an increase in torque of 10-30% over the current SKYACTIV-G petrol engine, whilst the super lean-burn improves engine efficiency by up to 20-30% over the current SKYACTYIV-G. 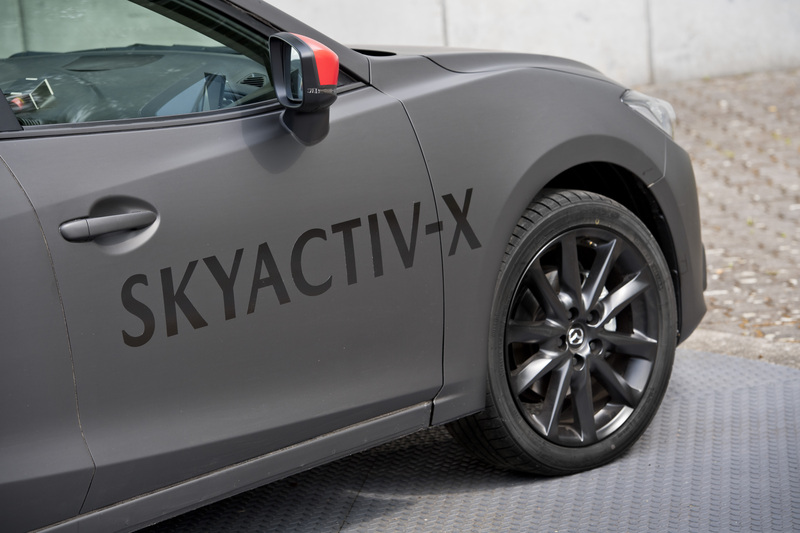 Moreover, SKYACTIV-X even equals or exceeds the latest SKYACTIV-D diesel engine in fuel efficiency. Operating with high efficiency across a wide range of rpm and engine loads, the SKYACTIV-X engine allows greater latitude in the selection of gear ratios, providing both superior fuel economy and driving performance.